Thanks to Jackson Guitars and Roadrunner UK we are offering fans of metal titans Machine Head the competition prize of a lifetime. 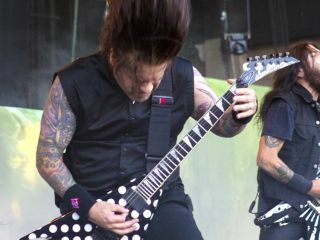 One lucky winner will scoop a Jackson Phil Demmel signature PDX Demmelition King V electric guitar - in black, naturally - and a signed copy of Machine Head's new album Unto The Locust. In addition, they will also win a pair of tickets to the show of their choice on the band's upcoming December UK tour and the winner and their guest will be treated to a private 30-minute tour of Mr Demmel's live rig before the show from the man himself! To enter, simply visit the competition page, answer the question and submit your details here. The winner will be responsible for their own transport and accommodation costs.